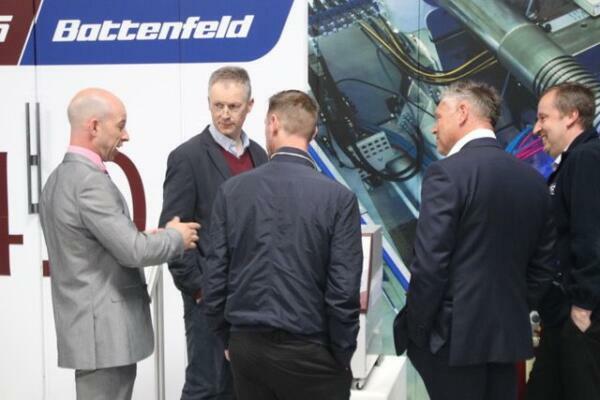 The Wittmann Battenfeld UK team sold out its Industry 4.0 connected factory message and event in Wellingborough last month. Demand exceeded supply as additional demonstration days in the subsequent week needed to be found in order to introduce visitors and customers to the technology. April 24 and 25 both saw varied perspectives and conversations on Wittmann’s Industry 4.0 technology and how this relates to MES systems and productivity solutions, together with issues such as SAP and other customer-relationship software and systems. WIBA UK visitors saw at first-hand how materials handling, drying, temperature control units and robotics all seamlessly interacted together on the injection moulding machine via the company’s B8 Unilog control and interface. The integrated moulding system is titled ‘Wittmann 4.0 Plug and Produce’. The convenience of the system incentivises moulders to make inroads into the advantages offered, chiefly; optimising production and production cost; providing manufacturing security behind the firewall of a Wittmann 4.0 router; and generating a very detailed and uniform data base for use with customers and in traceability and product analysis issues. The Wittmann 4.0 Plug and Produce system connects seamlessly to the Temi Plast 4.0 control system; which creates and integrates further added value for the user and is able to monitor and manage the entire factory output from a single and central point. The Temi Plast 4.0 systems have been successfully trialled in Italy to date, will exhibit at Plast 2018, Milan at the end of this month, and will also be featured at Wittmann Battenfeld Kottingbrunn, June 13-14, on the occasion, of the 10th anniversary of Wittmann’s acquisition of Battenfeld.